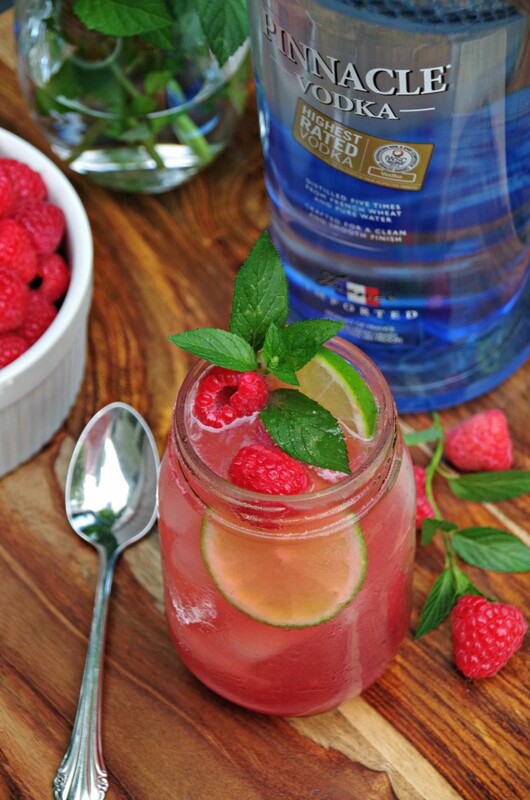 This #PinnacleCocktailClub raspberry vodka mojito recipe has been sponsored by Pinnacle® Vodka . All opinions expressed here are my own. Let me paint you a little picture of summer in the south. The weather is in the mid to upper 90s all week with high humidity. The rumbles of thunder as storms move in during the afternoon sound ominous. The cicadas are singing and the frogs are chirping as the sun starts to set. A slow after dinner stroll creates such a sweat on your body that you need a second shower before you put on your pajamas. By the time bedtime rolls around, all I want to do is sit down with a refreshing drink. I survived the day without melting into a puddle on my kitchen floor. That alone is a reason to celebrate. This raspberry vodka mojito recipe with Pinnacle® Vodka was the perfect ending to an otherwise hot and exhausting day. And if you have any leftover vodka, check out my post on uses for vodka that don’t include drinking it! Celebrate with a Raspberry Vodka Mojito! With the kids home for the summer since mid-May, our schedules have become rather lax. We have very few places to be and are in no hurry to go anywhere. A few weeks of company, a trip to the beach, and a whole lot of time spent relaxing on the patio are the only things on my agenda. But, just because my summer is lazy and unproductive doesn’t mean I have nothing to celebrate! I have a kitchen that is well stocked with bar essentials and I am happy to use it! There are so many things that I choose to celebrate during the summer and Pinnacle® Vodka is helping me do it with a delicious raspberry vodka mojito in my hand. 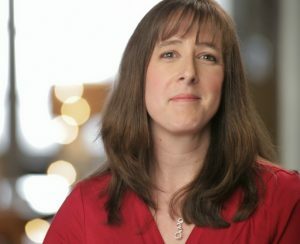 What am I celebrating this month? Finding a gift card in my wallet that actually still has money left on it. Finishing a book…and then starting a new one! Mopping the floor. Even if the dog then proceeds to get muddy paw prints on it again. The incredible array of fresh fruits, herbs and vegetables at my local farmers markets. And having my kids show an interest in cooking them. I love the fresh flavors and colors I find during the summer. 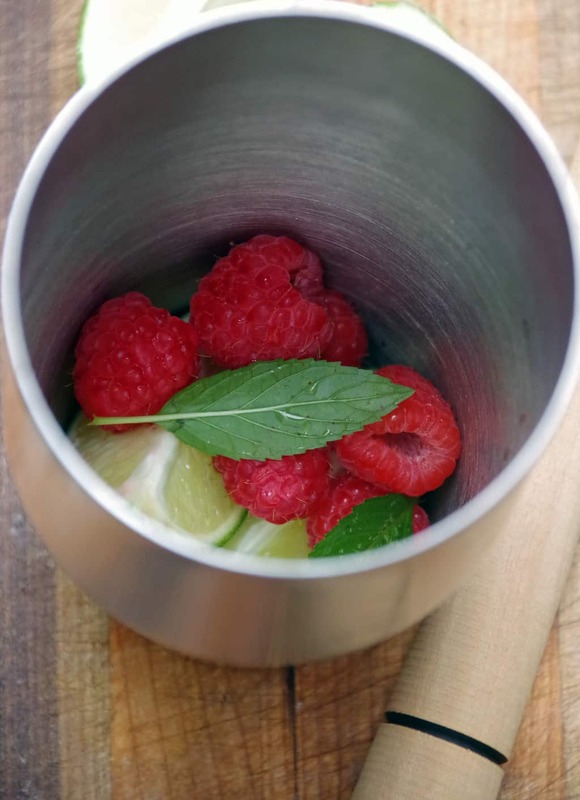 Berries are inexpensive, my mint is growing like a weed and with the addition of a few limes, I have a delicious raspberry vodka mojito recipe to sip after dinner. Pinnacle® Vodka is the perfect vodka for all occasions. Great for cocktails, for entertaining friends, or just a little R&R. Pinnacle® is quality vodka at an affordable price. With over 40 fun flavors, the possibilities are endless. I hope you can find a reason to celebrate this summer with a raspberry vodka mojito! Here is an affiliate link for a cocktail muddler on Amazon for crushing your ingredients. 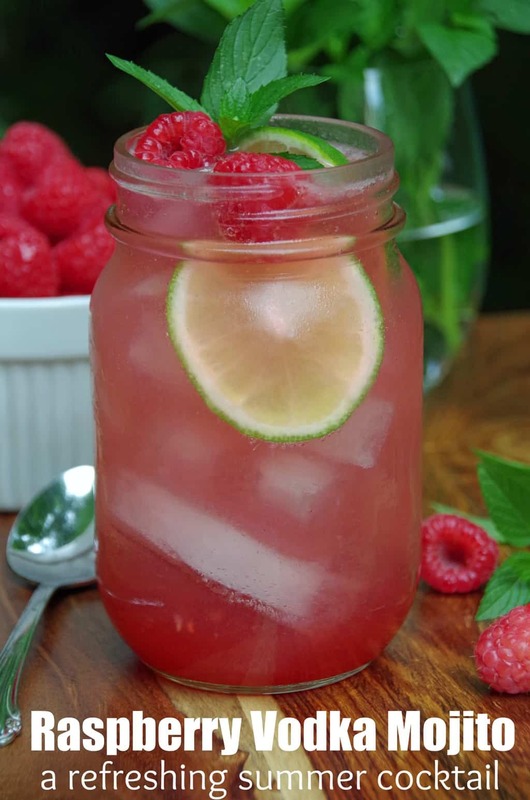 This raspberry vodka mojito recipe is lightly sweet and very refreshing! In a saucepan over high heat, combine sugar, water and 6 ounces fresh raspberries. Bring to a boil. Reduce heat and simmer 3 to 4 minutes. Remove from heat and let cool. Strain to remove seeds and chill. Looking for more great cocktail recipes? 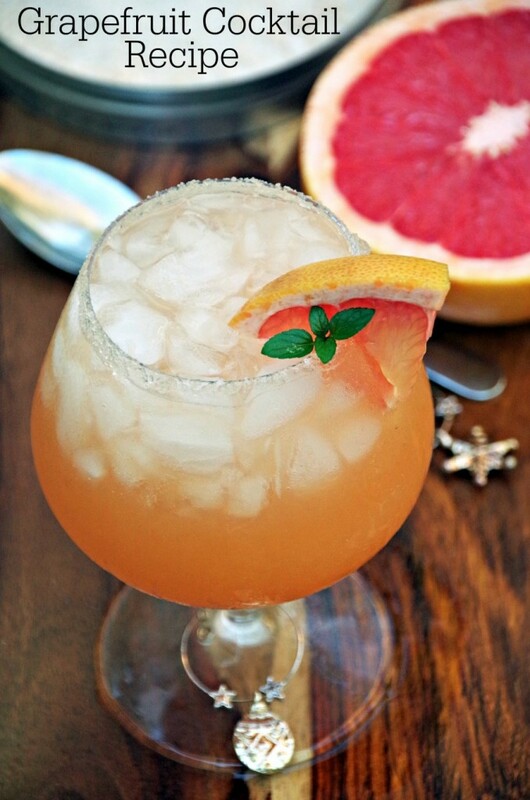 Try this easy grapefruit cocktail! Raspberry? Vodka? I'm sold! I'm definitely going to be making this for the weekend. This sounds pretty good. It would be very refreshing on a hot day. It was so delicious after a hot day! Loved it! Such a good combination! I just had Sonoma Brothers Vodka for the first time and its great in cocktails. So smooth! I will try this one for sure because I've been so into cocktail recipes lately. So much more fun to experiment at home than spend 12 dollars on a cocktail at dinner. agreed....cocktails out are way to expensive!